Tropical savannas are known for unusual plants that have adapted to unique environmental requirements. Savannas generally have a short rainy season, followed by long dry period. Australia, because of its remote location, has evolved a number of plants that are found only on the Australian continent. In some cases, however, the plants are grown commercially in other parts of the world. The jarrah tree is a species of eucalyptus that can grow to 120 to 150 feet tall. Growing in the Australian tropical savanna, the trunk of this tree is straight with no branches. The tree's leaves and flowers are found entirely at the top. Jarrah flowers are white and about 2 inches wide. The jarrah flowers every two years and produces small ball-shaped fruit. Jarrahs are very long-lived, with some specimens estimated to be 500 years old. The tree can survive in the savanna because of an adaptation called a lignotuber. Lignotubers are large underground swellings that store carbohydrates. The trees are used for lumber. In addition, when the trees are in bloom, beekeepers bring their hives to the trees to produce jarrah flower honey. Kangaroo paw is a biennial flower of Australia's tropical savannas. 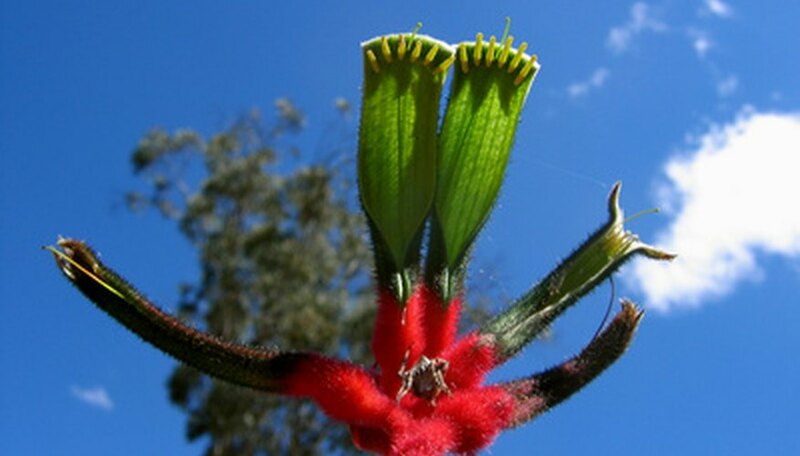 The official emblem of Western Australia, kangaroo paw flowers are fuzzy and green. They attach to red stems that can grow up to 4 feet tall. Birds, animals and insects drink the nectar from the flower. The hairs on the flowers serve two purposes. One is to retain dew and rain in the dry savannas. The other is to make the plant less palatable to animals and birds. Red kangaroo paw is exported for commercial cultivation as cut flowers in the United States, Japan and Israel. Cycas armstrongii is a cycad that grows in the Australian tropical savanna. It grows 12 to 24 feet tall and is 3 to 6 inches wide at its narrowest point. Its straight palm-like stem is topped by an umbrella-like growth of leaves. The leaves range from semi-gloss to bright glossy green. The leaves, which can grow up to 4 feet long, are made up of 100 to 200 smaller leaflets. A pollen cone crowns the top of the trunk in the center of the leaves. After pollination, round seeds that look much like coconuts ring the tree below the leaves.